9/23/18: Where Will New Housing Be Built? There’s no more pressing issue in Encinitas, San Diego County and California than our acute housing shortage. I know. You’re probably weary of the controversy, the overwhelming amount of data, the intense emotions, and the looming fear of a more crowded city. But one of the most important tasks I’m charged with as your elected mayor is to help us navigate a sensible way through this. If you don’t mind, I’d like to give you a brief rundown of what’s happening on the housing front, and why it’s so important. Hopefully it’ll shine more light on the issue and you’ll have additional information to form your own opinion, plus keep track of the progress of our efforts. I sit on the board of SANDAG, San Diego’s regional planning agency, and we’ve begun discussing the right methodology to distribute the state-mandated 171,000 housing units coming to the county in three years – the housing cycle that begins in 2021. These housing units have been assigned to the county from the state of California, so accommodating them is not optional. The question we’re asking is how should units be divided among the 19 jurisdictions in San Diego County – 18 cities and the county? What’s the analytic approach? Consideration of housing equity, essentially considering whether to spread lower income households equally throughout the county as opposed to clustering near areas with lower land costs. If you start with what already exists, you’ll see from the chart above that Encinitas currently has the lowest percentage of multi-family housing (i.e. apartment complexes, condos and senior housing) compared to every other city in the county. 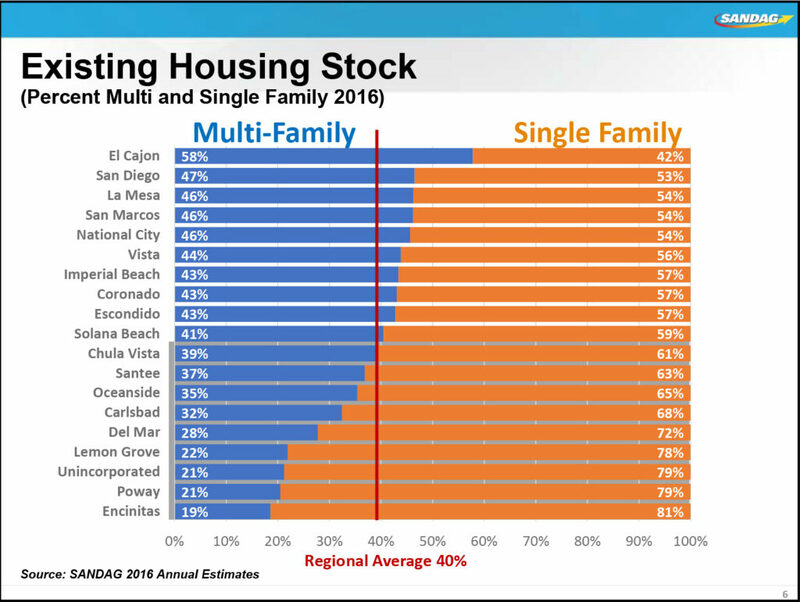 Solana Beach, Del Mar, Poway and every other city have a higher percentage of multi-family housing than Encinitas. In general, multi-family housing is considered to be more affordable than single family homes. If we want to reduce the mileage people have to travel to get from home to work, it would make sense to build new housing around job centers. 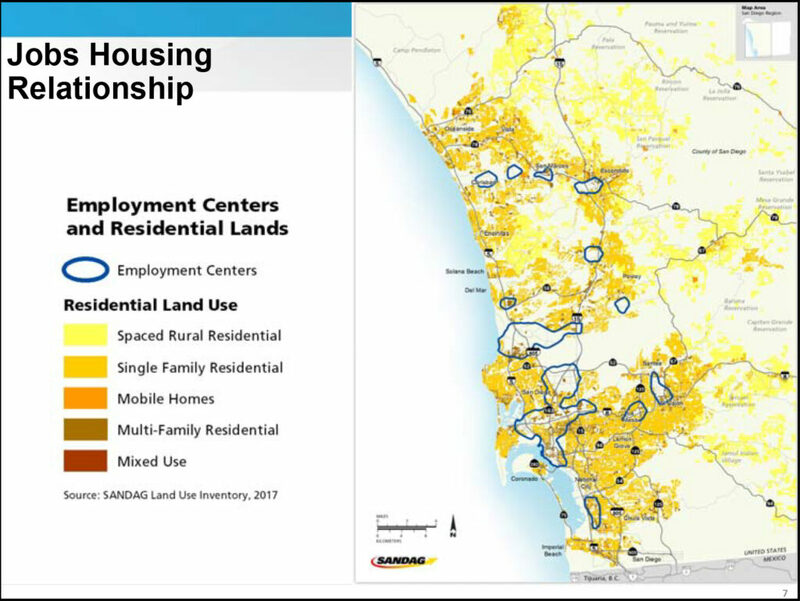 While many argue that new housing should be built near jobs, one North County mayor on the SANDAG board suggested the opposite – arguing that the large business parks in his city provide upper-income jobs while the housing is supposed to be for lower-income people. 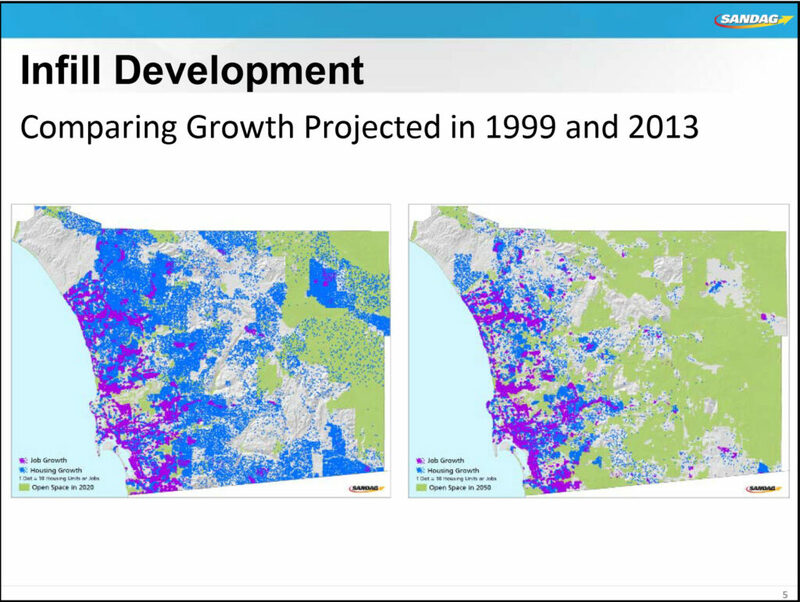 What stands out to me in the maps above is the reduction in backcountry housing growth from the 2020 planning document to the 2050 version. This shows the regional focus of preserving open space – in general, making housing denser in the areas it already exists and near the coast, instead of sprawling into the backcountry. In the big picture, and for climate and habitat protection, this is the right strategy. 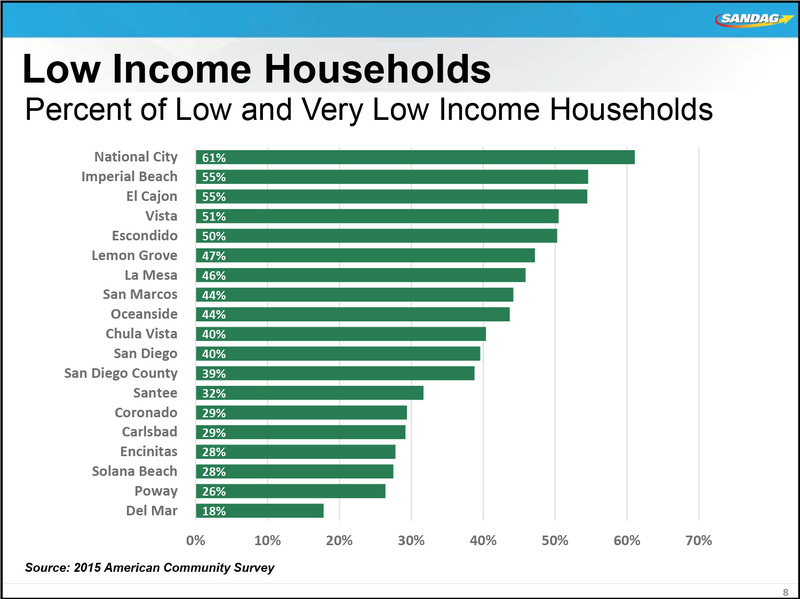 Encinitas has among the lowest percentage of low income residents in the county. Only Poway and Del Mar have fewer. Low-income in our county is a family of four earning $63,400 or less. We’ve struggled with our housing responsibilities in such a substantial and all-consuming way here in Encinitas that I feel strongly compelled to help work on the issue at the county level. I volunteered to serve on the SANDAG committee that will help form recommendations for the methodology to bring to the SANDAG board. Working together with the public and policy experts, we can provide more housing that’s affordable, ensure that new housing is in keeping with community character, and commit to integrating the transportation piece of the puzzle into the housing piece of the puzzle. 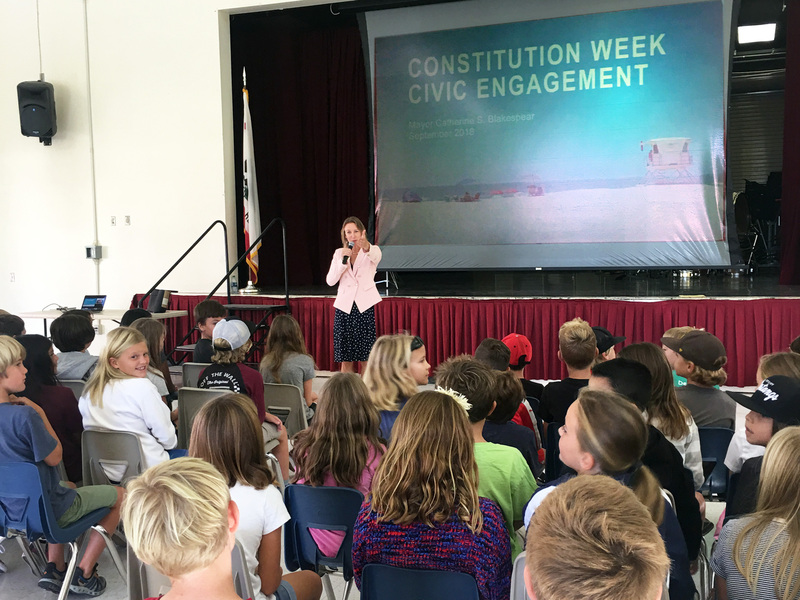 It feels so important to take time to speak with school children about the importance of our American system of government. I don’t recall learning nearly as much about our democracy, founding fathers and the principles they articulated, or overall citizenship, as it appears that kids get today in public school. (I offer this perspective as the mother of a fourth and a fifth grader.) This is a great development. I know there has been a resurgence in the civics effort since Sept. 11, 2001, and I hope it continues. 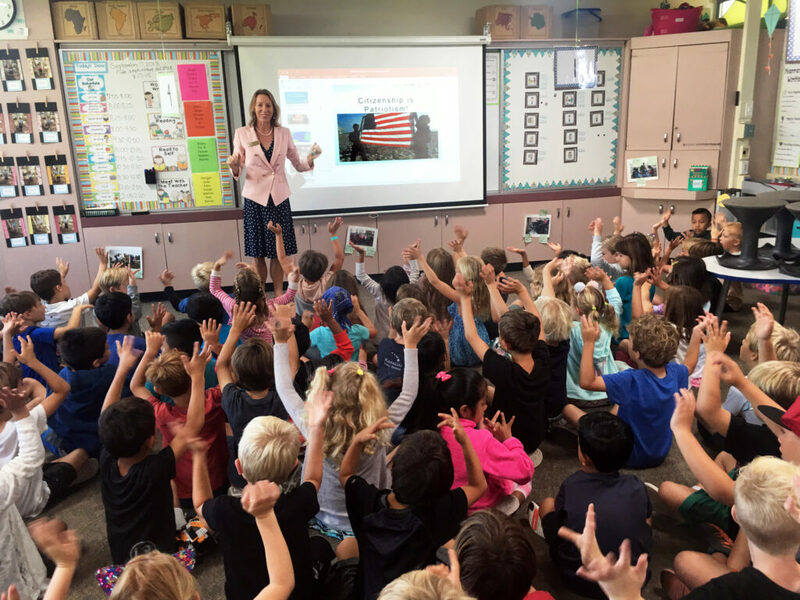 This week I spoke to students at two elementary schools – Ada Harris (top) and Ocean Knoll (bottom), and in two weeks I’ll be speaking to students at Paul Ecke Elementary and at Flora Vista. If you are a teacher or have a student in a class that you’d like me to visit, please let me know. I’ve put together a great powerpoint, which includes among the images, Betsy Ross presenting our flag, the symbol of America, to George Washington. When I speak with the students, I compare our three branches of government to the perennially popular kids’ game Rock/Paper/Scissors – each branch serves as a check on the other one and there is no ultimate winner. One of the things I also emphasize is the need to vote, because the people who sit at the table make important decisions. In the last midterm election (2014), only 17 percent of those under age 29 voted, so bring a 20-something person with you to the polls. We have to do better this time! There couldn’t have been more white-hot energy in the room when Congressional candidate Mike Levin and Lt. 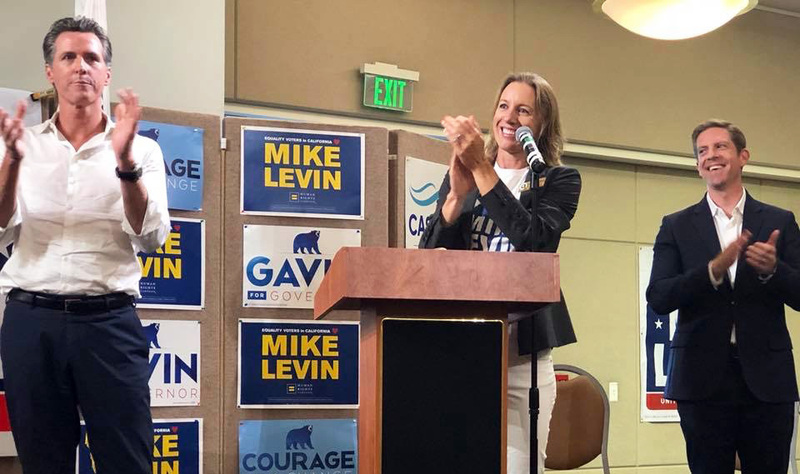 Governor Gavin Newsom (who’s running for governor) greeted 500 supporters and a host of local viable candidates in Encinitas last weekend. I was thrilled to welcome them to our city. Speaking of elections, we’re five weeks from a major election, and my campaign continues to need your support. If you’re able to do so, please support the good work we’re doing in Encinitas by contributing to my campaign for re-election or getting a free yard sign delivered to your home. Thank you for your ongoing interest and support! Please see below for more campaign events. Today, Sunday, Sept. 23, 12:30 p.m.: Meet and Greet for Assembly candidate Tasha Boerner Horvath and me at the home of Carol Wolf.Email seawolfbeach@gmail.com or me for address and details. Today, Sunday, Sept. 23, 3 p.m.: Walking and Door Knocking with Assembly candidate Tasha Boerner Horvath and me at Leucadia Oaks Park. Email warren@tasha4assembly.com with any questions. Tuesday, Sept. 25, 6 p.m.: District 3 City Council Candidate Forum. Ada W. Harris Elementary School Auditorium at 1508 Windsor Rd, Cardiff. The only public opportunity to hear exclusively from the two District 3 city council candidates, incumbent Mark Muir and challenger Planning Commissioner Jody Hubbard. Sunday, Sept. 30, 10 a.m. to 6 p.m.: Oktoberfest on Mountain Vista Drive in New Encinitas. Many candidates for office have booths here and participate in the parade. It’s a great chance to talk with multiple candidates all in one spot. Plus, it’s a family-oriented blast! I hope to meet you there in the midst of the festivities at Booth M23.